Violet and Peter are making their way to Papa Jean Louis’s to deliver soup, when . . .
they see a wolf in the elevator . . .
a shortcut leads them to a spooky cave . . .
then something growls in the shadows! Is Violet’s make-believe story just in her imagination? 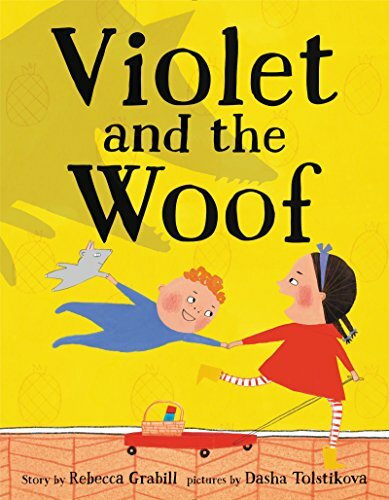 With excitement and more than a few surprises, Violet and the Woof will have readers wide-eyed, smiling, and asking for the story again and again. This book is great for one-on-one or small group sharing where kids can discuss what’s imaginary and real. VERDICT A fun, lighthearted addition to most picture book collections. Violet’s storytelling skills and overactive imagination are augmented by the colorful illustrations, done in a naïve style and combining the everyday environment and the fairy-tale world. It’s charming… . [T]he playful expressions on the children’s faces make it clear that Violet is (mostly) in control of her story—and its happy ending. All the crafts and free printables to immerse yourself in Little Red Riding Hood (and Violet and the Woof)! Retell Little Red Riding Hood (aka Violet and the Woof)! Free Violet and the Woof Picture Book Wallpapers! Free Printable Coloring Pages for Violet and the Woof! Why Sequencing is So Important to Early Literacy Plus Free Printables!